CoolCat started with a clean sheet of paper , and the result is this beautiful Aluminum radiator for Series 3 E-Type. This radiator will cure your cooling system issues. All brazed aluminum construction assures the maximum possible heat transfer. This radiator is designed to mount precisely in the Series 3 engine bay...the original shroud will bolt right up, the A/C condenser will bolt right up, the original radiator mounts will bolt right up. Hose fittings are compatible with your factory hose set. 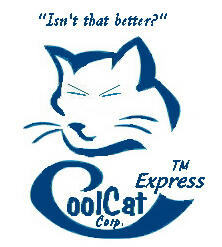 The best value for your E-Type, available exclusively from CoolCat Express Corp.